Join us in the MMoA Galleries to hear artist, Paul Zelanski, speak about his work in the current MMoA exhibition, MAAd Men of Mystic. 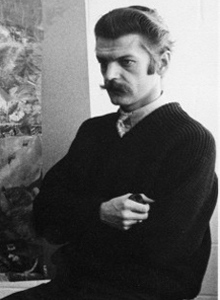 Zelanski, along with the two other featured artists John Gregoropoulos and Anthony Terenzio, exhibited frequently at MMoA from the 1950s to 1970s. Over the years, Zelanski’s style has explored painterly qualities as well as precise and technical interactions of color—he has made assemblages; painted on wood and heat-formed plastics; and used found paper ephemera. At times he has blurred the line between painting and sculpture, but he has always been consistent in his exploration of color theory. Zelanski will speak about the changes in art in the last 60 years, their relationship to the artists of MAAd Men, and the comradeship formed amongst these three men.